Today a pre-auction exhibition by some of the worst artists in Britain opened at Somerset House. They have kindly donated their tripe to a sale in aid of the homeless charity Crisis. BBC News has posted a slide show of some of the appalling rubbish on offer (title link). Gillian Wearing's sculpture of Craig O'Keefe just about passes muster, but needs a placard to tell his story. 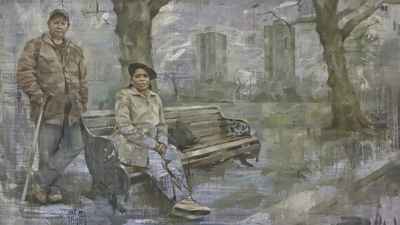 Jonathan Yeo's The Park Bench is outstanding, capturing the essence of homelessness in a most artistic way; his subjects have dignity. But the rest...! Clearly there is a crisis in British art as well in its housing. The Crisis Commission shuffles along until 22 April. The charity auction takes place at Christie's on 3 May. Correction: Somerset House, NOT Christie's (CLICK).